In this week's Scrubbing Up, Dr Catriona Morton says drastic measures are needed to save Scottish drinkers from themselves. In order to curb dangerous drinking, supermarkets must be prevented from selling cheap alcohol and awarding loyalty points with purchases, she says. We are facing a new pandemic - alcohol as a major risk factor for poor health. In Scotland, the majority of adults are exceeding recommended drinking limits and 5% (probably more) are alcohol-dependent. Voluntary codes, hazard-labelling and NHS health promotion efforts are simply not working - so we need to hit the drinking culture at the heart by introducing minimum pricing, and removing supermarket loyalty points for alcohol. Scotland now has the world's eighth-highest level of alcohol consumption. We need to do something now to protect not only the health of Scots but the NHS. Pandemics require robust, evidence-based policies. The doubling of alcohol consumption in the last 40 years reflects a marked reduction in relative price: some alcohol now costs less than bottled water. 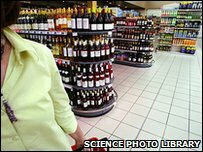 A feature of young people's binge drinking is that they 'pre-load', by relying on shop-bought alcohol. The home is the commonest drinking location for 75% of Scots. Supermarkets are therefore crucial, because of their 'special deals' around cheap alcohol. Our society doesn't allow loyalty points on cigarette purchases, as it seems perverse to have additional incentives to buying harmful toxins. Loyalty points do, albeit indirectly, make alcohol cheaper. Unlike cigarettes, alcohol does not necessarily harm at "low doses", but our epidemic is because of pervasive high levels of intake, and this is more than sufficient to justify restricting both price and points. Working as a GP in a Scottish urban practice means that I have teenage patients admitted from casualty as they are too alcohol-intoxicated to safely go home: occasionally they have to be put on a ventilator in intensive care until the alcohol wears off. And many GPs will have witnessed the devastation families face when adults in their thirties and forties - some with relatively young children - die of liver failure or cancer, due to alcohol. Following the Scottish smoking ban in enclosed public places, there has been a 20% drop in heart attack admissions in non-smokers ( and a 17% year-on-year drop overall). Whilst not all of this may be attributable to smoking behaviour, the ban has clearly had a major impact. In people from smoke-free households, the level of nicotine by-products in adults fell by almost half, as their exposure to passive smoke fell - and perhaps most important of all, by a third in children. Prior to the smoking ban, there was good public health evidence to support it - we now face the same scenario in relation to alcohol. The Scottish Government needs to urgently take action on this - by supporting minimum pricing and dropping loyalty points and encouraging the UK government to follow suit. Such a move would be welcomed by health professionals both north and south of the border. The financial burdens to Scotland of this continued level of drinking are commensurate: over £400 million NHS costs, £170 million for social work and all told, an estimated £2.25 billion a year. There are the terrible costs to people's lives too - six alcohol deaths per day in Scotland, a reflection of our world-leading rise in cirrhosis. Alcohol is severely undermining the well-being of Scotland and we should again support a sensible, proportionate, and life-saving public health measure. Is 'sorry' the hardest word? Does size zero obsession damage health? Headroom: Are you drinking too much?